General view of the works as at 1810. After Stevenson's "Account of the Bell Rock Light-house"
© With permission of, and thanks to, the owner. • A genealogical insight into some of the key men who built it. Read about John Reid's life in George III's navy; and the ancestral origins of the Logans; amonst others! • A select choice of letters sent by Robert Stevenson to Capt. David Taylor giving a clear insight into Stevenson's character and work ethos . . . and his use of the phrase "Shiver Me Timbers"
• A link between Scotland and Newfoundland. When is a handgrip a sea monster! • A selection of scans from Ian Cowe's photographics . . . and more of the Georgian kind! Plus Eddie Dishon's contribution to the Bicentennial. • An eclectic mix of newspaper cuttings mainly from "The Scotsman", "Arbroath Guide" and "Arbroath Herald". 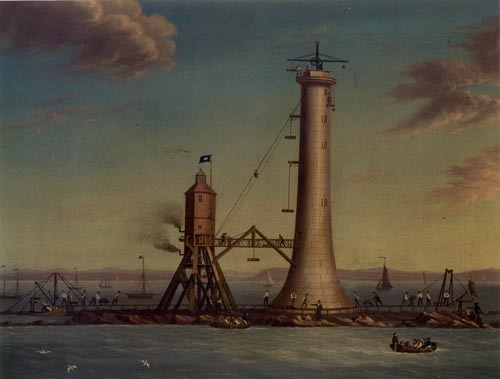 • An account of WHAT WAS DONE and WHAT WASN'T DONE over 200 years of the Bell Rock Lighthouse's anniversaries - 50, 100, 150 and 175 years of celebration. • A ragbag of interesting facts collected on the way through these researches. 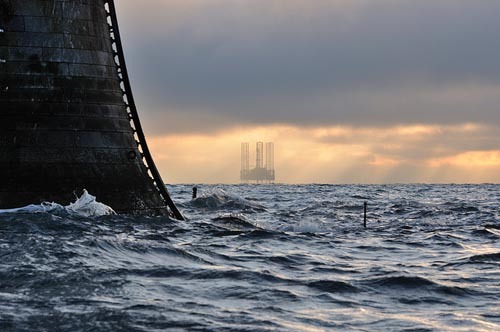 • The world's interest in the Bell Rock Lighthouse (2003-2010). Towers . . . Old and New! I was speaking to a friend recently and remarking on just how many books relating to lighthouses had appeared on the shelves in recent years. I said at the time that I felt the subject in general had become somewhat oversubscribed! Guess what . . . out of the blue I received a request to review another book recently published, this time Ken Trethewey’s “Ancient Lighthouses”! I was aware the subject had been touched on earlier in 1959 by D. Alan Stevenson in “The World’s Lighthouses Before 1320.” I have a copy! However, whereas D. Alan mentions it more in passing, Dr Trethewey gives over his entire book to the subject – all 322 pages of it! And his definition of Ancient stops at 400 AD – the time the Romans were about to depart Great Britain never to return. Considering this is one of a series on Pharology, this is certainly a man with a mission! This book is impressive at all levels; Epic in its proportions; Monumental in its aspirations and Academic in its ideals. Anything that blinks with little more than a few candelas is liable for a mention. Be prepared then for a dazzling history into the Classical World and its Civilisations, and be satisfied that you recognise at least one name – that of the Pharos of Alexandria, one of the Seven Wonders of the Ancient World. But of course he also takes into account ports, forts, coastlines, tower-like structures and anything else that might have remotely served as a lighthouse. Each chapter is “top and tailed” with a Descriptive paragraph, followed by the Objective of that particular section. The narrative contains sub-sections; as well as many quotes from various sources, all of which are carefully referenced, and accompanied with colour plates, engravings, maps and charts. Finally, the section ends with Conclusions and Reference Notes. In my view a good way of managing the information. In Chapter 7, he lists the location of possible/probable sites - all 144 of them. Dr Tretheway’s expertise on telling the story of these early lighthouses is certainly clear and concise – as one would expect from a man with a technical background. The material is well organised, and in my view as good as it gets without getting mired down in excessive detail. He certainly leaves no stone unturned in his search for information. There is a good chance, however, that there may be those who will consider certain areas a tad over the top! Yes, perhaps, but there are equally as many students at the highest academic level, and worldwide, who will make good use of every aspect of the text! As for myself, I don’t think it is overdone. My motto is: If you are going to do something, do it well! The entire book is literally crammed full of material and illustrations, but there are places where I would “lighten” it up, given it were my publication . . . I say this with long-term experience in a morning newspaper as a time-served compositor and linotype operator, eventually re-mustering into computerised typesetting in the post-Wapping era. Two novel items which are worth mentioning. Firstly, he adopts a new dating system instead of the old BC and AD. I’ll go no further on that one but it seems the modern way of dating antiquity. Secondly, he uses several what he calls Topic Taxonomy Charts or Mind Maps. You can see many examples of this on Internet images. I’m sure Charles Darwin might have made good use of one to explain his theories on evolution! Is it expensive at £50? Well, it’s certainly not cheap but you do get a vast amount of information for your money. That’s about the cost of a night out for two with a glass of wine – if you’re lucky! I think I would certainly rather have the book . . . ! Of course, this publication is not meant just solely for the lighthouse fraternity. It aims further afield, much further . . . for libraries, universities and other places of academic learning the world over. As he adds to the Pharology series, it will become in its own right a reference work of encyclopedic status and importance. Whatever else, for Ken Trethewey this must viewed as his lifetime’s magnum opus or Great Work. . . I wish him All the Best. 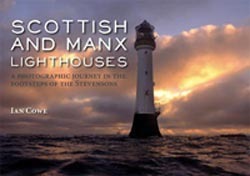 Review:“Scottish and Manx Lighthouses: A Photographic Journey in the Footsteps of the Stevensons” (published for the Northern Lighthouse Heritage Trust by Whittles Publishing;182 pages; soft cover; £20). THIS BOOK is almost certainly as good as it gets, and it is doubtful if it will ever be bettered . . . . . . unless, that is, you have the money to charter your own helicopter! It is timely, if not perhaps overdue, that such a book should now be available! As automation is now the order of the day (the last lighthouse to be converted being Fair Isle South in 1998), and resident lighthouse keepers all but a memory, many will welcome it (if not for sentimental reasons) but as an important overview of the Stevensons' achievements in lighthouse construction in Scotland and the Isle of Man. The first thing which will surprise you is the size - a generous A4 (30 x 21 cms (11¾ x 8¼ in. ), with 182 pages crammed full of wonderful photographs, many of which are superb aerial shots taken of the rock towers . . . and not only of lighthouses, but other fascinating related subjects. Everything from a “needle to an anchor”. Well perhaps not quite, but you know what I mean!! It also includes a sprinkling of wildlife for good measure. Beautifully produced, the cover price is £20 (soft covers), which is, as far as I am concerned, an absolute bargain and worth every penny! Oh, I hear you say – just another coffee-table offering! Well not really. I suppose it all depends on how you view it. Of course, it is primarily about lighthouses, but it can also be viewed as a travel guide for exploring the magnificent coastal scenery of Scotland and the Isle of Man; or even for the architect who can study the construction styles which the Stevenson engineers adopted over the the late neo-classical, Victorian and early 20th century – there are never really two exactly the same; or maybe for the enthusiastic lighthouse bagger out to tick them off as he enjoys the fresh air and countryside on the way through - just three of many good reasons why this book will appeal to many! A real bonus is the author's trials and tribulations as he tramps his way through “dub and mire” to reach his goal, all of which is described in his personal diary notes - in itself a real treasure. What more can I say! My advice is to go and get your copy now before stocks run out! As for me, I already have mine . . . however, I am just beginning to realise that it will also make an ideal Christmas present for family and friends . . . must get myself another half-dozen copies! 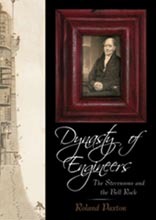 "Dynasty of Engineers - The Stevensons and the Bell Rock"
Published by the Northern Lighthouse Heritage Trust (2011). Now available (or can be ordered from) from Whittles Publishing or any good bookseller. Also from Amazon. In Professor Paxton's new book we see at long last closure (echoing James Will's quote below) on what many consider to have been an injustice to John Rennie who, for reasons explained in "Dynasty of Engineers”, has been largely ignored for the part he played in the construction of the lighthouse. 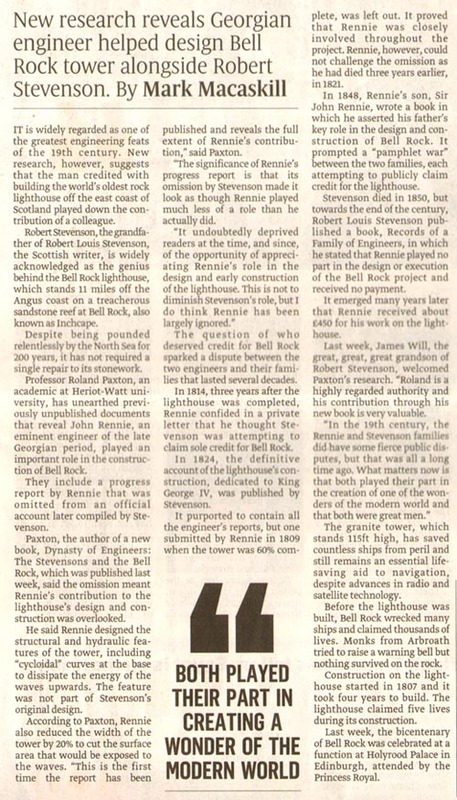 Prof. Paxton, the world leading expert on the Bell Rock build, details carefully his researches and includes Robert Stevenson’s fascinating report on the lighthouse last published in 1813 and the important previously unpublished Report of 1809 which shows that Rennie was clearly playing his part as Chief Engineer. He goes on to show other aspects of Rennie's input to the ultimate design - the slightly narrower tower than that proposed by Stevenson; the pronounced curve at the base of the tower which effectively deflects the force of the waves away from the main building; and the interlocking jigsaw pattern of the courses of the solid part of the house. This book is not necessarily aimed for academic and architectural consumption, or for that matter lighthouse enthusiasts, but for the general reader who may have noted the lighthouse's recent Bicentennial and whose interest in the subject may have been kindled in passing! Ultimately the book once and for all draws a line under the controversy between the two families which has rumbled on now for the best part of two centuries. Part III: An illustrated timeline of Smith and Stevenson lighthouses in Scotland and the Isle of Man. The book is handsomely illustrated by engravings (mainly from Stevenson's "Account" of 1824) and many fine lighthouse photographs by Ian Cowe - www.flickr.com/iancowe - and from the archives of the National Library of Scotland and Northern Lighthouse Board. Published by Whittles at £20 [ISBN 978-0-9567209-0-0] it is not unreasonably priced taking into account it is hard-backed with an attractive dust cover! Moreover it includes much original research which will make it compelling reading for many! It should also be noted that Prof. Paxton has waived any fee for his work, and any profits from sales will go directly to The Northern Lighthouse Heritage Trust. - D.T. FORGOTTEN LIGHTHOUSE HERO HAILED AT LAST, by Mark Macaskill - from the 'Sunday Times' - 6th February 2011 . . . "In the 19th century the Rennie and Stevenson families did have some fierce public disputes, but that was all a long time ago. What matters now is that both played their part in the creation of one of the great wonders of the modern world. and that both were great men." - James Will, a descendant of Robert Stevenson. See full article below - With thanks to the "Sunday Times" and Mark Macaskill. Review - “The Lighthouse on Skerryvore” by Paul A Lynn (Whittles Publishing; 2015; paperback; 130pp; soft cover; £16.99). THERE is always great interest amongst lighthouse lovers when a new book appears on the shelves . . . especially when the subject matter deals with the tower at Skerryvore, said by many to be the “Jewel in the Crown” of Scottish lighthouse architecture! Ever since Alan Stevenson's magnum opus of 1848 “Account of Skerryvore Lighthouse”, little has appeared in print about its construction – apart from the odd paper written by an aspiring academic, or an article or two appearing from time to time in some journal or local newspaper. In that respect, therefore, this publication is important. However, on opening the book it soon becomes clear that the title actually belies its content! This is, in truth, a book of comparisons – between what one might call a “trinity” of lighthouses (Eddystone, 1759; Bell Rock, 1811; and Skerryvore, 1844), all built on semi-submerged reefs. All three tend to go hand-in-hand when considering the construction techniques in such dangerous locations. But make no mistake about it, this is more than just a coffee-table offering. There is much to satisfy the expert, but not too much to make it over-bearingly technical! I congratulate Paul Lynn on his articulate and skilful narration, and in particular his careful attention to the characters of both father and son – Robert Stevenson (Bell Rock), strict father, ambitious; and Alan Stevenson (Skerryvore), classically-educated, and almost certainly brow-beaten by his father into the family engineering business! To many, Alan's spectacular achievement did outshine that of the Bell Rock, but, unlike his father, he was not mired in the Rennie/Stevenson controversy, as was the case at the Bell Rock. In every respect he was his own man! Another unlikely bonus for me (apart from being nicely illustrated with fine photographs and engravings) is his description of the Western Highlands and the conditions of the inhabitants who lived on Tiree at the time of building – in itself a veritable history of the area! One small comment I would make! The writer does say that he did not consult original sources, and from that point of view I think he might well have benefited from a visit to the Stevenson archives in the National Library of Scotland (Acct. No. 10706); also the records of the Northern Lighthouse Board, now held in the National Records of Scotland (Ref. NLC). Both sources provide a plethora of information by way of Letter Books and Minutes! He may even find enough material there to warrant a second edition. In that case, I might even be persuaded to buy another copy!! I am reminded of the old Scottish Presbyterian minister in Aberdeenshire, whose library of some 17,000 volumes, eventually became central to the Aberdeen University Library, and who, when found sneaking another of the same title into the manse, said: “ You are never safe with only one copy of a good book."! All in all, I found it a great read and have no hesitation in recommending it to the lighthouse aficionado as well as the casual reader! You will not be disappointed. "Northern Lights - The Age of Scottish Lighthouses"
Published by NMS Enterprises Limited - and available the National Museums Scotland, Edinburgh, and all good booksellers. Disclaimer - Whilst every care is taken to ensure the accuracy and integrity of the information contained within the Bell Rock website, the owner does not accept liability (financial or otherwise) arising from the use of material in these Web pages. It should also be noted that there is no financial gain whatsoever to the owner of this site.